With the polar vortex at its climax, the No. 14 Villanova Wildcats (17-4, 8-0 Big East) served the DePaul Blue Demons (11-9, 3-6 Big East) their own version of a winter storm with an 86-74 win highlighted by Phil Booth’s 19 points and eight assists. Here are my five takeaways from Wintrust Arena. The hallmark of a national brand is the ability to find multiple ways to win and the Wildcats’ dominance on offensive rebounds made the difference with 14, which turned into 11 second chance points. Blue Demons coach Dave Leitao admitted the offensive rebounds became harder for to overcome from a mental standpoint. The Wildcats went three-point crazy as they went 15-of-35 (42.9 percent) with nine of the makes coming in the second half. Colin Gillespie made a living from long range as all of the sophomore’s 12 points came from that distance. The Wildcats’ efficiency was at their peak as they turned the ball over three times, which proved to be one of many ways to counter the Blue Demons’ 53 percent shooting from the field. Wary of DePaul’s length, Booth knew it was important to attack and break its defense as the game wore on. “DePaul is a very good defensive team with the length they present and it was good for us to take care of the ball and to still try and attack,” Booth said. Going into this season, Saddiq Bey was one of Jay Wright’s heralded recruits, but no one knew what his role would be. Eric Paschall raved about Bey’s off-season practices as Big East media day and mentioned to not be surprised if he becomes a key player in Nova’s rotation. Fast forward to Wednesday night as Bey put together his first career double-double with 16 points and 11 rebounds. Wright has relished in Bey’s ability to adapt in adverse situations with the ceiling of potential to be unlimited. “Saddiq is smart, has a great basketball IQ and is why out of all the freshman, he was able to get in the quickest because he’s got good physical strength. The most important aspect of him is that he comes from Josh Hart’s high school and has the competitiveness that Josh has and that is really valuable,” Wright said. After going five straight games with 18 or more points, Paul Reed proved to be ineffective as he finished with six points— his lowest scoring output since scoring the same amount against Boston College on Dec. 22. Booth made it an emphasis to make life difficult for the sophomore forward, who was held to eight points in the first meeting of the season on Jan. 2. [Paul] can score in many different places. He is very tall and athletic, who is skilled and happened to miss some shots again,” Booth said. 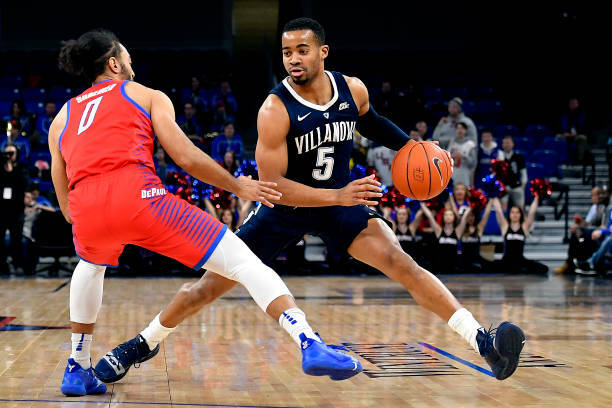 Barring a meeting in the Big East Tournament, the Wildcats swept the Blue Demons in the season series for the sixth straight season and have won the last 18 overall. Bey was in elementary school when the streak started on Jan. 16, 2008, but doesn’t look at the dominance, but more as another win in the column on the road to postseason play.